Jackpot City Casino Review - You Just Hit the Jackpot - Read Here Why! Online casino Jackpot City has been around since 1998, growing all the time. Currently it offers more than 400 slots, video slots and table games as Digimedia Ltd, Villa Seminia 8, Sir Temi Zammit Avenue, Malta. The company is authorized and licensed by the Lotteries and Gaming Authority of Malta and was awarded the eCOGRA Seal of Approval (eCommerce and Online Gaming Regulation and Assurance). 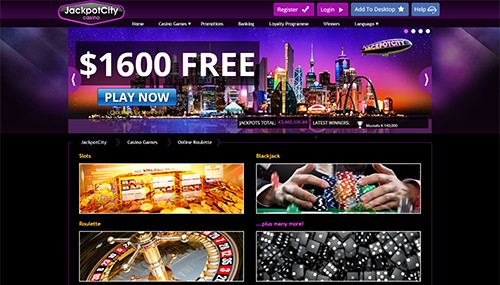 Jackpot City Casino scores highly across the board for software, security, banking, games, customer support, reliability and trust, and bonuses and promotions. Welcome and Weekly Bonuses can be wagered on a fun range of Slots and Table Games from Microgaming in a safe and secure environment, and 24/7 Customer Support is always available if help is required – making membership easy to recommend. With all the important criteria in place at Jackpot City Casino – a fun time should be had by all! Before you first download the software and setup your account you’ll have the chance to choose a special Welcome Bonus. Right now the most popular is a 100% match up to €/$200. Players have 7 days to claim their new player sign-up bonus after setting up their account. The rules are fairly stringent – a 50-times play-through or rollover is required and any winnings are allocated 50% to your cash balance, and 50% to your bonus balance. Any winnings attributed to the Cash portion of your balance can be withdrawn at any time, subject to meeting all terms and conditions. The most important conditions are that a €/$200 bonus has to be played through with €10,000 in total wagers, and they can only be played on Slots, Keno and Scratch cards for a 100% deduction. If you play video poker or blackjack (not classic blackjack), your play only counts for 10%, and classic blackjack counts for only 2%, where you would have to play 50 x 50 x €/$200 = €/$500,000 to meet the requirements. As for other games like Roulette, Sic Bo, Craps, Baccarat, Table Poker, Casino War and Red Dog, no play counts. This means that roulette players get zero credit for their play towards a bonus requirement. If that’s what you want to play, better to call and ask to have the bonus removed before playing! Most casinos offer some type of loyalty reward or complimentary play for their regular guests. 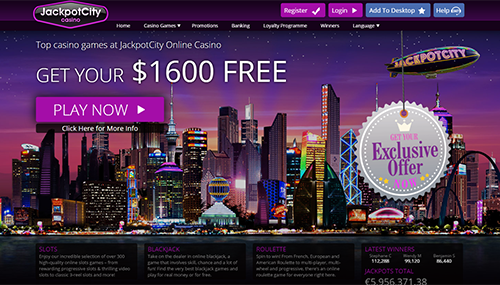 Jackpot City offers a point for every €/$10 in action that accrues in a Loyalty account for redemption later. 100 Points may be redeemed for €/$1 once 5,000 points have accrued. Jackpot City has always been geared towards slots and video slots. Today they boast more than 300 online slots, plus video poker, scratch cards, keno, and table games. New machines include popular land-based products like Pharaoh, Blazing 7’s, Fishing Derby and The Dark Knight. Video poker games are plenty, with Double Bonus, Jack’s or Better, Loose Deuces, All American Poker and others in single and multi-line varieties. Some include the double-up (Power Up) option, and some have progressive jackpots. Table games include Craps, Baccarat, blackjack and tournaments, as well as roulette. Several varieties of blackjack are available such as Classic blackjack, Chinese blackjack, California 21 and Pontoon. 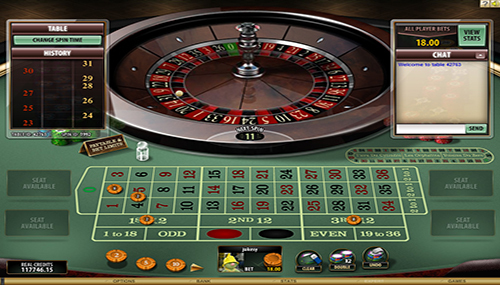 Roulette is offered with standard American, European and French wheel games. The French wheel has the usual single zero with call bets and a track for neighbor and orphan wagers. It also includes an instant La Partage payoff when zero is spun – saving half of all outside, even-money wagers. The game is very fast, with wagers from €/$1 to €/$500. Other roulette options include multi-wheel, multi-player, and progressive. There are over 300 Microgaming slots to choose from at Jackpot City Casino, and the latest releases continue to be added all the time. You can play classic 3-reel slots, video slots and Jackpot Slots that all offer a variety of adventures, bonus rounds and features. There are also several varieties of Roulette, Blackjack, Video Poker and Scratchcards, whilst the Tables Games section includes games like Craps. Jackpot City is powered by the globally popular Microgaming software, a leading software provider that makes hundreds of the world’s most popular online slots and casino games. You will be able to enjoy blockbuster slot titles like Game Of Thrones and Tomb Raider, as well as a range of Microgaming Gold Casino Games like Roulette, Blackjack and Video Poker. Microgaming also has a top-class reputation for both reliability and stability. You will need to verify your ID and address before cashing out at Jackpot City. Use the verification form found in the “Cashier” area and fax or email the required documents, and expect the process to take several days. When you are ready to withdraw, you can also expect the process to take several days for E-wallet and longer for Debit, Credit and Direct wire deposits. Minimum withdrawal is dependent on the instrument you used to deposit/and/or withdraw. A cheque may be mailed under certain circumstances, regardless of your deposit method. If you want to deposit funds at Jackpot City Casino, you can do so in US Dollars, Australian Dollars, Great British Pounds, Polish Zloty, Swiss Francs, Euros and Swedish Krona. These currencies can also be used to deposit funds via a range of credit cards, debit cards, e-wallets, virtual vouchers, Mobile billing and direct banks transfers, all of which can be found in the “Banking” section. The Jackpot City Mobile-Casino is available on all modern mobile phones and tablets, such as Android, iOS, Blackberry and Windows. The mobile-casino can be visited directly in your mobile browser, or you can download the Jackpot City App, and both options offer a high-quality experience with smooth functionality and outstanding graphics. There are over 200+ mobile-games to play, including slots like Games Of Thrones and Tomb Raider, as well as traditional casino games such as Roulette, Blackjack and Video Poker. Jackpot City’s full-range of promotions is also available, whilst safety and security are as good as they are on Desktop. One of the big attractions of Jackpot City Casino is the chance to become an instant millionaire with comparatively small bets. This is all thanks to the Central Microgaming Jackpot linked to popular games like Mega Moolah (also available on Ruby Fortune Casino) and Major Millions. A percentage of every bet placed on these games boosts the Central Jackpot, which can be triggered randomly at any moment. Jackpot City Casino is licensed by the Malta Gaming Authority which, as one of the strictest jurisdictions in the world, make sure that all casinos they issue a license to are fair, safe and secure. Jackpot City Casino earned its license by incorporating cutting-edge Secure Socket Layer Encryption technology that makes sure all financial transactions are processed in a safe and secure environment, whilst all games and software are independently tested and certified by eCogra. The Jackpot City Customer Service Team is also on hand 24/7 as back-up in case customers have any worries or problems. American Samoa, Australia, Belgium, Czech Republic, Denmark, France, French Republic, French Guiana, French Polynesia, French Southern Territories, Germany, Guadeloupe, Guam, Hong Kong, Hungary, Iran, Israel, Italy, Korea, Martinique, Mayotte, Myanmar, New Caledonia, Northern Mariana Islands, Philippines, Puerto Rico, Reunion, Romania, Saint Barthelemy, Saint Martin, Saint Pierre and Miquelon, Singapore, Slovakia (Slovak Republic), South Africa, Spain, Taiwan, Turkey, United Kingdom, United States Minor Outlying Islands, United States of America, Wallis and Futuna. Dutch, English, Finish, French, Italian, Norwegian, Polish, Portuguese, Spanish, Swedish. As a place to play slots, the Microgaming software provides an excellent experience, and with more than 300 slots, players will have plenty to choose from, so very good ratings there. However, while the table games run well also, the bonus offered at 50-times play-though and with most of the games, including roulette, excluded from the bonus rollover, the rating is lower here. According to ecogra.org, which reviews online gaming sites, Jackpot City’s overall games offer a 96.78% payback rate. Slots come in at 96.6 and table games at 97.86 – those numbers are pretty good.